This evening, myself (Freddie) and Harriet came to Tomandalices for the night. After a lovely barbeque with some of Tom’s friends from climbing, we were told that there was a hedgehog on the front lawn. And so Harriet befriended it. And that was that. P.S. A message to all you ‘animal friendly’ people out there: This was conducted in a safe environment, and the animal’s carer was on standby at all times. No harm came to the animal, and only a minor injury on Harriets behalf. How exciting! 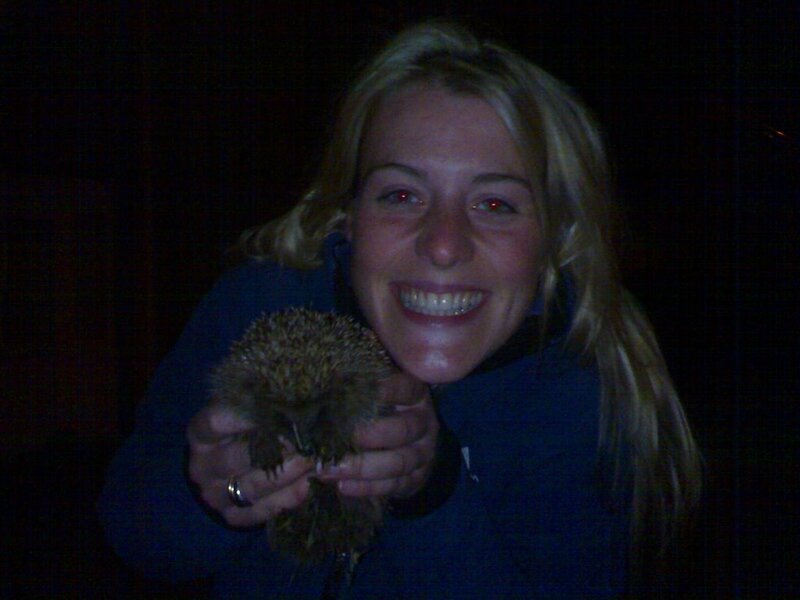 Some friends and I had to an emergency stop on Friday night because a hedgehog was running (surprisingly fast on its little legs!) across my road. After it had disappeared into the safety of the shrubbery I really had to fight the urge to dive in and get a better look… they’re so small and cute and pickupable! I hope the funeral goes well today and will be thinking of you all and especially Daddy Norton. Hurrah! Can we call it Harry the Hedgehog? Sorry to miss out on your barbecue of joy. Hope today goes off ok – thinking of you all. I nearly hit a headghog with a parang once whilst doing some fairly extreme gardening where i used to work. Fortunately for the little blighter i missed it and transported it to some bushes where it lived happily ever after. Cute hedgehog. Tell me what is a parang? My gardening skills leave a lot to be desired!!! Hope all is going ok., Thinking of you and hoping neuts are rising George. Love to all.